Optimizing your PPC campaign around a landing page is not the same as optimizing your website for general organic search results. The end goals are different. Your website functionally has many duties from providing information about product and services – to giving existing customers access to customer service. You can add to this mix a lead generation process, and cross / up-selling opportunities. Your website is like a Swiss Army Knife. Conducting keyword research to understand how consumers search for your products and services. Writing landing page copy with a single focused message. Developing a landing page Call to Action process with an appropriate conversion form. Using Landing Page SEO best practices for content and page markup. Writing advertisement copy that reflects consumer search behavior. Conducting multivariate testing of all elements of the landing page and advertisement. Defining your important KPI, and tracking the results with analytics tools. Make sure there is Ad-Keyword-Landing Page cohesion – all three must be complementary. 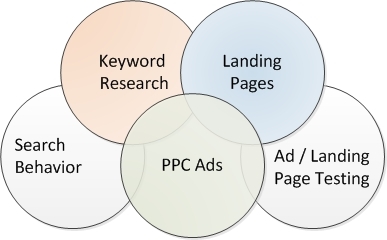 These are the high-level variables that define a good PPC Eco-systems. There are complexities associated with some of these – especially in the area of Call to Action best practices, and Landing Page SEO. Other areas that impact a PPC strategy are geo-location, and mobile searches. Both of these effect content strategy, and landing page design.